While everyone knows being close to winning doesn't mean anything, Drew is pleased with the effort his team is putting forth of late. 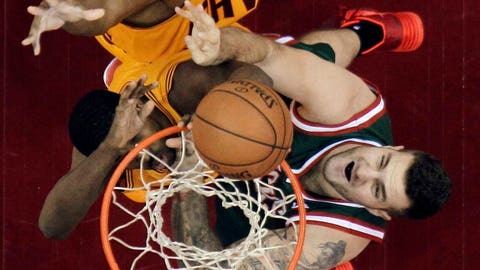 Despite being bruised and battered, the Milwaukee Bucks are still fighting. They just have no wins of late to show for it. For the third time in four games, the Bucks put themselves in position to win late only to fail to execute just enough to lose. Milwaukee couldn’t get a big stop or hit an open look late in regulation and missed two tying 3-point attempts in overtime to fall 114-111 in Cleveland on Friday night. 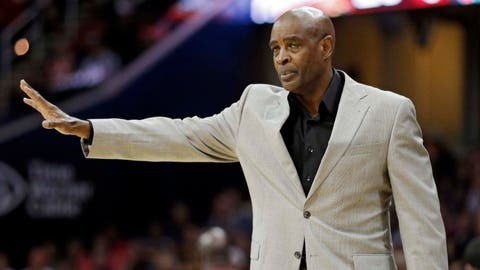 "We just haven’t been able to get over the hump," Bucks coach Larry Drew said. "I thought our guys played really hard, and I thought we were very, very competitive. As shorthanded as we are, we still fought and put ourselves in a good position. We just couldn’t get over that hump. "It was a really hard fought game. We just had some defensive breakdowns going down the stretch and our inability to capitalize in transition was a big key too." Up 96-94, Brandon Knight had a 19-foot jump shot rim out with nine seconds left to give Cleveland a chance to tie. Kyrie Irving easily got into the paint but missed the layup. Tristan Thompson used his length to tip the ball in to tie the game with 1.8 to play. The Bucks have struggled all season long to execute plays out of a timeout, but they ran Drew’s play well and got an open look. Khris Middleton appeared to rush the shot slightly and he missed short, sending the game to overtime. "We had a good look," Drew said. "In that situation, you want a good look. We got the good look and it just didn’t drop." After being a game-time decision with an illness, Irving scored 10 of his game-high 39 points in the extra session. He either assisted on or scored all of Cleveland’s 18 points in overtime and took the game over. "Kyrie was penetrating us and getting in the paint area," Drew said. "We just tried to mix it up and change defenses to force him into some contested jump shots. We just lost guys. That’s just a defensive breakdown. "He’s a special guard. He practically carried them. When he turned it up when he felt he needed to, that put a lot of pressure on us, particularly on the interior with him penetrating and causing us to collapse." The Bucks fell behind 110-105 after Earl Clark hit a big 3-pointer with 44 second left in overtime, but Middleton answered with a trey of his own. After a pair of Irving free throws, O.J. Mayo drilled a shot from distance to cut Cleveland’s lead to 112-111 with 17 seconds left. Irving made two free throws on the other end with 10 seconds to play, forcing the Bucks to need a 3-pointer to tie the game. Milwaukee executed another play out of a timeout to set up Mayo for an open look at the tie but he missed. Ekpe Udoh corralled the offensive rebound and dished it back out to Mayo for an even better look, but he missed again. "We got the looks that we wanted," Drew said. "Needing a three, he got two good looks, one off a designed play and one off the offensive rebound. Ekpe had the awareness to throw it back out and he got a good look at it. He just couldn’t get it to drop." While everyone knows being close to winning doesn’t mean anything, Drew is pleased with the effort his team is putting forth of late. Now they just need something to show for it. "We’re a team that’s really banged up and depleted right now," Drew said. "To come out and to take a New York team into double overtime and a Cleveland team into overtime, I’m proud of our guys that they came out and played hard. We’re still not going to be satisfied until we get over that hump, but sooner or later we will." Miroslav starts: With Ersan Ilyasova shut down for at least a couple of games, the Bucks are down to just three healthy big men. Knowing how big and powerful Cavaliers center Andrew Bynum is, Drew opted to start 7-foot rookie center Miroslav Raduljica on Friday and bring Ekpe Udoh off the bench. Raduljica finished with seven points, four rebounds and two blocks in 17 minutes. "With no Zaza (Pachulia), there was no way we could matchup with Bynum early," Drew said. "The last thing I wanted to have happen was John (Henson) or Ekpe get into foul trouble early. I elected to go with Miroslav and he did a really good job. "He picked up those two fouls but he accomplished what we wanted to, just making Bynum work for his shot and keeping a big body on him." Raduljica’s first start made the Bucks the only team in the NBA to start three different rookies this season. Extra notes: Friday marked Milwaukee’s fifth overtime game in 26 contests, leaving the Bucks on pace to play an NBA-record 15 overtime games. The franchise record is 10 overtime games set in the 2009-10 season. Bucks forward Caron Butler went through shootaround Friday but missed his 11th straight game with swelling in his left knee.